TCM Pallet trucks for sale, the range has been developed to provide our customers with the most reliable and efficient technology in daily operation, they have been designed to meet the most challenging requirements even in the most demanding environments. 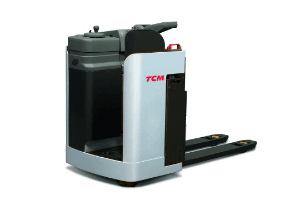 Managing your pallet loads, with power and ease, all the way from the shop floor to the heavy-duty industrial environments TCM has a model to meet your needs; our family of low lifters will get the job done in all conditions. TCM’s ergonomically designed tiller arm, on the walkie trucks, makes it possible for the operator to walk beside the truck, this gives full visibility over the fork and load and reduces the risk of foot injuries. All the controls are at the operator’s fingertips. Onboard Truck Management: The control panel at the tiller arm clearly displays information on battery status, hour meter, date, and clock and warning messages. The TCM truck computer has built in service functions to reduce downtime, it is also easy to change performance settings based on the operator’s skill and experience. Friction Force Technology for Constant Ground Contact: TCM’s patented linkage design ensures that all the wheels – and in particular the drive wheel – always have ground contact this means that the truck carries the load safely, on all surfaces, with full traction. Powerful AC Motor: The energy-efficient AC motor ensures that the truck responds to the slightest command from the operator, while regenerative braking saves energy and provides good braking capability this gives the operator total control of acceleration and braking, even on slopes. 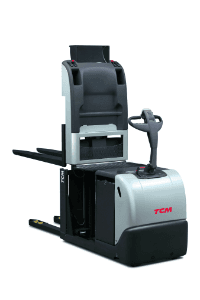 Top Speed: The low lifter Ride/Sit On, as shown above, have an increased top speed this is produced specifically for long distances to travel within the warehouse environment. Long Forks: Are available from 1000mm to 2375mm and with widths from 480mm to 730mm this is allow for two pallet loads at a time to be transported. Seating: Side on seating, on the LLS model, which is fully adjustable along with the floor height provides a safe protected working environment. Also a mini steering wheel adds to the operator’s comfort.